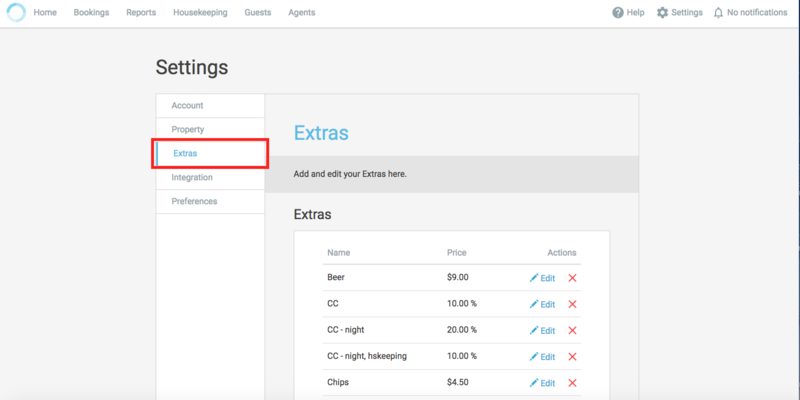 Extras allow you to go above and beyond providing just accommodation for your guests, and they're great for upselling guests with prepared packages. You can also have extras appear on the Housekeeping report! Jump up to Settings, and then click Settings & Preferences. Once you're on this page, click the Extras tab, and scroll right to the bottom. Here you'll see the Add extra button. Once you click that button, you'll be able to enter in details about this extra. Charge by percentage - this is for extras that are charged as a percentage. For example, credit card surcharge. Charge by the night - this is for recurring extras, and will charge the guest every room night. Show in housekeeping report - doing this will make the extra appear on the housekeeping under Requests. Bed configuration - the extra will change to an amount of $0, and the housekeeping report will show the name of the extra under Bed configuration. When you go to Settings & Preferences, and go to the Extras tab, you'll be able to see your existing extras at the bottom of the page. The first 15 extras will be listed alphabetically, and the rest will be on a different page. Click Edit next to the extra you want to change, and the Edit extra popup will appear. Make the changes that you want, and then click Save. There's a red cross next to the Edit button for each extra. Find the one that you want to delete, press the red cross, and a confirmation screen will appear. When you click Yes, the extra will be deleted. Any booking that currently has that extra applied to it will keep it, and the extra won't appear in future searches.